When schools began cutting music programs, one local educator created a haven for talented youngsters. Now, her creation is a dynamic place where youth are thriving. 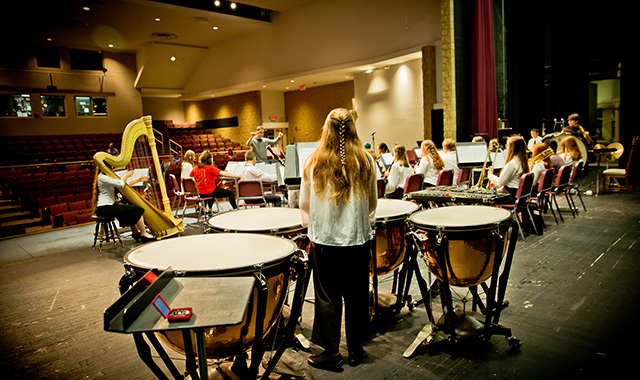 The McHenry County Youth Orchestra places musicians into groups according to their skill level and offers five performance opportunities per year. It’s the reason why Reupert has headed the McHenry County Youth Orchestra (MCYO) for two years and has been involved with the organization for two decades. The MCYO, with its tagline of “Educating and Inspiring Exceptional Musicians,” began in the 1980s as local schools were cutting music programs. One woman, the late Dr. Marie Ann Vos, wanted to do something about it and started working with young musicians. She began with 14 students learning in the basement of her home. That group has grown to 40 members with hope for more in the future. Reupert is a professional trumpet player and has been a musician for 35 years. MCYO performs five concerts per year. Through an audition process, musicians of all ages are placed in a group according to their skill level. There are Prelude, Intermezzo and Symphony orchestras. The bulk of members are in the high school range. Musicians are taught privately by expert-level instructors at Lakeside Arts Park at the Dole Mansion in Crystal Lake. Known collectively as The Academy, these lessons encompass clarinet, saxophone, flute, oboe, piano, trumpet, viola, violin and cello. Most of the faculty carry master’s degrees and all are professional performers themselves. At the helm of the orchestra is Emanuele Andrizzi, who also serves as a professor and the director of the orchestra at Roosevelt University in Chicago and Schaumburg. In music circles, he’s considered to be a top conductor. This past December, the group was gearing up for one of its biggest concerts of the year – a holiday performance at the Raue Center for the Arts in Crystal Lake. The group, when combined with Woodstock High School’s orchestra, numbered close to 100. “When you have that many kids playing on stage, it’s very powerful,” Reupert says. Josh Moore, 17, from Lakewood, doesn’t know what he’ll do with his skills as a tuba player, but he plans to carry his musicianship with him throughout the rest of his life. Now in his fourth and final year of the orchestra, he finds it bittersweet finishing out the season. He’s forged invaluable friendships. Josh goes to Crystal Lake Central High School, where there’s a music program but no orchestra. He’s been playing the tuba for eight years, getting his first taste of the standout instrument from his mother, Mary Moore, who serves on the MCYO board. His mom believes it’s important for Josh and his siblings to get involved in music and develop the skill to read music, which can be like a foreign language. Mary joined the board two years ago, believing in the organization’s mission. She lends her skills as a certified public accountant, serving as treasurer. Josh has been fortunate to also be a part of the MCYO’s chamber group. It’s one way the MCYO gets the word out to others in order to recruit new members and boost music appreciation in the community. Instead of bringing the entire orchestra to an event, a select few go out to perform, giving spectators a taste. Whether it’s for a fall concert at Prairie Ridge High School or a chamber group event, selections can run the gamut from classical to pop. Josh liked learning and performing Korsakov’s “Procession of the Nobles.” It helps when a skilled conductor “magically” brings performers together. With any orchestra, Andrizzi explains, there is a lot of preparation in identifying arrangements that are feasible for young musicians. Depending on the concert, he may choose something like a theme around Mozart, pop music or holiday selections. There are some students who are not part of the orchestra, but attend lessons at The Academy. They perform in two recitals per year. Private lessons are 30 minutes for $30; 45 minutes for $45; or 60 minutes for $60. Students generally range from fifth grade through high school, although residents of the nearby Del Webb retirement community have come for private lessons as well, Reupert says. Seasonal fees range anywhere from $425 for the Prelude orchestra to as high as $745 for the Symphony orchestra. Kids can audition for the Academy or orchestral program at any time during the year. Various financial options are available. Visit mcmusiccenter.org to purchase tickets to an upcoming concert, learn more about joining the MCYO or find out about private lessons. This entry was posted on Tuesday, January 29th, 2019 at 11:59 am	and is filed under Arts & Entertainment. You can follow any responses to this entry through the RSS 2.0 feed. Both comments and pings are currently closed.